Today, 3rd Feb 2016 is day 4 of Brahmothsavam of Sri Parthasarathi - it was the radiant Surya prabhai in the morning and the pleasant ‘Chandra prabhai’ in the evening. The moon is the easiest celestial object found in the night sky — when it's there. One that is visible to naked eye. Earth's only natural satellite hovers above us bright and round until it seemingly disappears for a few nights. The rhythm of the moon's phases has guided humanity for millennia — for instance, calendar months are roughly equal to the time it takes to go from one full moon to the next. Moon phases and the moon's orbit are mysteries to many. For example, the moon always shows us the same face. That happens because it takes 27.3 days both to rotate on its axis and to orbit Earth. We see either the full moon, half moon or no moon (new moon) because the moon reflects sunlight. How much of it we see depends on the moon's position in relation to Earth and the sun. Moon’s influence on Earth's cycles, notably tides, has been charted by many cultures in many ages. The moon moderates Earth's wobble on its axis, leading to a relatively stable climate over billions of years. The Moon (Luna) is one of the largest natural satellites in the Solar System, and, among planetary satellites, the largest relative to the size of the planet it orbits (its primary). The Moon is thought to have formed approximately 4.5 billion years ago, not long after Earth. There are several hypotheses for its origin; the most widely accepted explanation is that the Moon formed from the debris left over after a giant impact between Earth and a Mars-sized body called Theia. 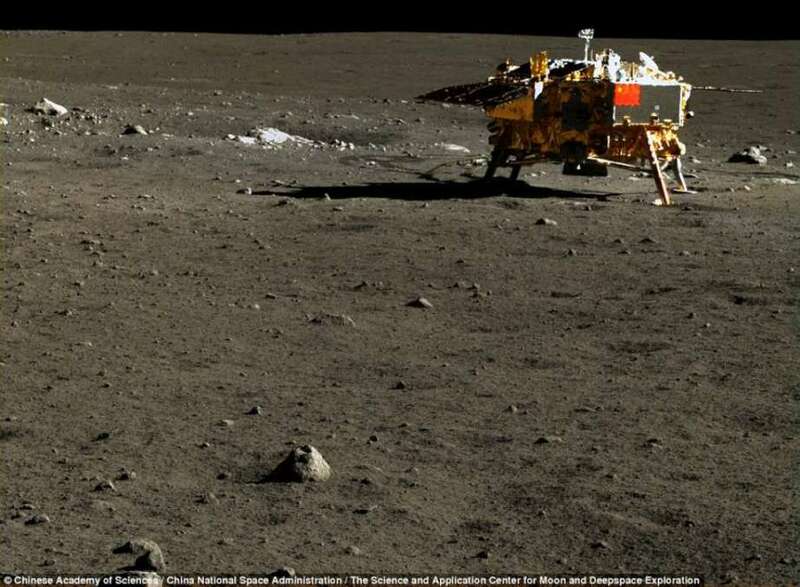 Here is a photo of the moon's surface through the keen eyes of Chang'e-3, China's lunar lander. On December 14, 2013, the lander and Yutu, its piggybacking rover, touched down on the moon's northern Mare Imbrium—making China just the third country ever to perform a soft landing on the lunar surface, after theSoviet Union and the United States. China National Space Administration publicly released thousands of the mission's stunning colour photos sometime in 2015. But the shots haven't enjoyed much publicity in Western media until now, in part because China typically releases images by 12 to 18 months after receiving them, and uses an unwieldy website written only in Chinese to showcase them. சந்திரன் குளிர்ச்சியானவன்; முழுமதி மிகவும் சந்தோஷத்தை தர வல்லது. சந்திரனுக்கு நிலா, அம்புலி என பெயர்கள் உண்டு. நிலவை நோக்கி கைநீட்டி, தன் குழந்தையுடன் விளையாட வருமாறு அம்புலியை அழைக்கும் பருவம் - அம்புலிபருவம். பெரியாழ்வார் கண்ணனை வளர்க்கும் பருவத்தில், தனது 'பெரியாழ்வார் திருமொழியில் 'பத்து பாடல்களில், சந்திரனை வளரும் அழகு கண்ணனுடன்’ விளையாட அழைக்கிறார். மேகத்தில் மறையாமல் விளையாட வரச் சொல்லி "மஞ்சில் மறையாதே மாமதீ மகிழ்ந்தோடி வா" என்கிறார். Here are some photos taken during the evening Chandra Prabhai purappadu.